Business leaders are increasingly looking to IT to deliver a mobile workspace that allows employees to access corporate data, applications, and communication resources on their devices of choice. 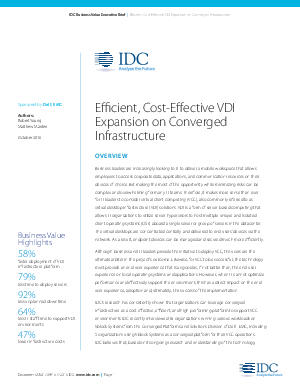 IDC’s research has consistently shown that organizations can leverage converged infrastructure powered by Intel® Xeon® processor as a cost-effective, efficient, and high-performing platform to support VCC environments. IDC recently interviewed 16 organizations running various workloads on Vblock Systems from the Converged Platforms and Solutions Division of Dell | EMC, including 5 organizations using Vblock Systems as a converged platform for their VCC operations.